Vortex Mixer offered is backed by latest technology support and features electric motor that is used for turning pipe facing upwards that is attached to small rubber bowl for holding beaker of liquid that needs to be mixed. The rubber bowl allows quick turning and in creating vortex or twisting flow within water placed on it for mixing. 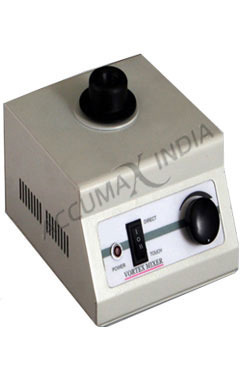 These vortex mixers also feature control that allows users superior control over fast or slow running as well as revolve continuously for defined length of time.